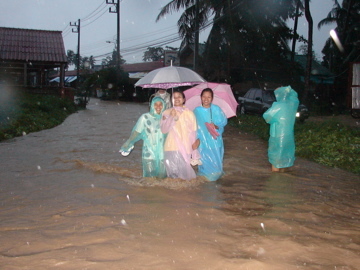 Yesterday we survived the worst flooding that Koh Samui has ever seen. It started with a full day of rain on Monday which carried on into Tuesday. Yesterday we lost electricity and then lost water and were wondering how much worse this storm was going to get. My father showed up in his car and we all decided to go to the nearest supermarket, Tesco Lotus, to stock up on supplies because the met office was predicting the rain to continue. On the road the water was starting to rise and a few of the streets were already underwater. 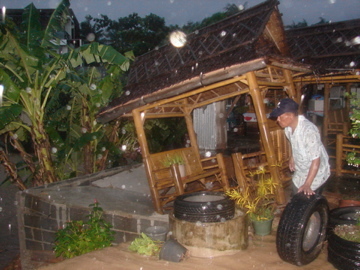 Many people had already taken their cars and motorbikes to higher ground to park it there overnight and away from the small side roads where they live. Inside the Tesco people were buying up meat, eggs, umbrellas, rain ponchos, and batteries. Surprisingly, people were still quite calm despite the inevitability of the flood. Maybe it’s a Buddhist thing. By the time we finished shopping and tried to get back home, people were putting sandbags against their doors and alleys and preparing for the worst. The road to Bob’s house had become completely unpassable. Pickup trucks were attempting to cross the water and decided to turn back, so we knew for sure that Bob’s little second hand Honda Accord would not make it through the flood waters. So leaving the car on the main road, and with grocery bags in hand, we tried to get to Bob’s house on foot. We passed the small sort of shanty town which lies on lower ground and saw it was all completely gone. The river behind it has burst its banks and engulfed it completely. The water was rising fast around our legs and at a part where the road dipped a bit lower the water was turning into a torrent. We decided to walk through the neighbouring property instead, since it was on higher ground, and try to cut through to Bob’s house. Everything was going fine until I took one step and suddenly found myself up to my chest in a huge hole! Bob then soon did the same. We had to jump over the big hole to get across. Thankfully we all made it. In the dryness and safety of Bob’s house, we made sure to wash off our feet, in case of bacteria, and sat down to watch the water level rise. On the street people were desperately trying to push their motorbikes through the rising tides. A river of brown water ran through the streets. 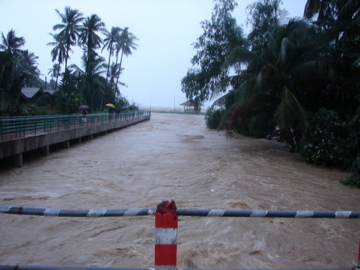 The trunks of the coconut trees were covered with snails, praying mantis, grasshoppers and spiders trying to escape the flood waters. 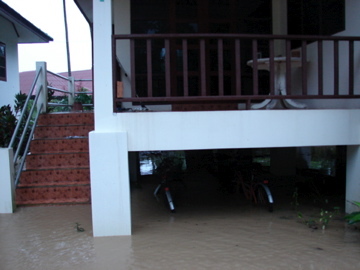 Most houses here are built up on stilts, so we were safe and sound. Finally, the rain let up for a bit and turned into a sprinkle, and we noticed the water level was dropping fast. Now was our chance to get back to our own home — it was now or never. We set off through the water, stepping carefully and trying to stay on the concrete of the street. A few other people were also venturing out, and by the time we neared our home two pick-up trucks were driving past. A good sign indeed. Our compound was totally flooded out too. A few European neighbours who saw us passing came out onto their balconies to ask us how the flood level was doing. But we decided that since the water was falling, now was our chance to get out there with a camera and record some of the flood. After pretending to be photojournalists, we headed home and set up for the night, lighting candles, boiling water, and taking a bucket-bath to wash off whatever bacteria may have been in that water we were walking around in. Much to my surprise, last night we got electricity and running water back, thank goodness. Now it’s Wednesday, so it’s been two days of solid rain, and it’s raining right now as I type, but we still have power and water. 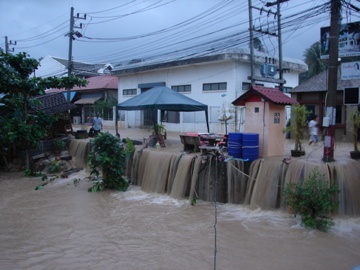 Thankfully most of the water seems to be draining away and our compound is no longer underwater, though I have no idea what the rest of Samui looks like. I imagine there are a lot of people right now with no home to go to. Where do these people go when their slum gets washed away? I suppose they rebuild again — probably in the same exact place, and in a few years the water will come and wash it away again. We are very very lucky, and very thankful, to be sitting in our nice dry house, out of the rain, drinking coffee and using the internet. But we’ll see whether this rain continues, and how bad it will be. We could be underwater again by tonight if it doesn’t let up. In the meantime we wait, and see. Glad you are safe and sound.what a mess. Hi Thiru — I can’t say what it will be like in a few weeks… this is apparently freak weather, not a normal rainy season. The first two times I came to Samui were both in late December (Christmas time) and the weather was great! But how bad will it be in 3 weeks from now? Really can’t say. But I feel pretty sorry for the tourists who have just arrived a few days ago and now find that the beaches have been destroyed. Might be better to go to another island? I would not bet on it… the beaches are GONE!!!! You sure you can’t head somewhere else, like Phuket?